If gay men and lesbian women are expecting their own organizations to come to their defense when acts of violence threatening their existence loom large, well, they better reassess that trusting surmise and start looking elsewhere for protection. And fast. A series of posters have appeared throughout the working class neighborhoods of London warning off lesbians and gays. 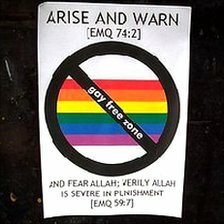 These posters have been appearing in several East London neighborhoods including White Chapel, Shoreditch, and Poplar over the past several months and have been accompanied by an increase in violence against gays in those areas. The source of the anti-gay sentiment and vitriol has been easily identified and, no surprise, it’s coming from Bangladesh immigrants and their East London Mosque. Although the mosque publicly claims to “stand together against homophobia”, it has hosted numerous anti-gay speakers and events including a Spot the Fag contest. There were six reported attacks against gays in these neighborhoods in January 2011. Across London, crimes directed against gays and lesbians have risen by 22.2%. Yet despite the upward swing in anti-gay violence, the response of authorities and gay groups has been just as forked and deceptive as the lies coming from the East London Islamic leadership. Here is the response of the Rainbow Hamlets LGBT Community Forum. This gay outfit is more focused on slamming supposed racism and ‘islamophobia’ then speaking up for the very people they are organized to protect. We also condemn those who use these incidents to create a moral panic and stoke up racist or Islamophobic sentiment. At present the people responsible cannot be accurately determined, but it is clear that whoever is responsible, they do not represent any of the local communities. But as Andrew Gilligan, London Editor of the Telegraph points out, this gullible gay group is putting their multicultural mantra before the hard facts. This statement contains at least one palpable untruth, one questionable assumption, and one dubious elision. As any gay man in Tower Hamlets will tell you, and numerous victims of homophobic hate crime in the area have told me, “the people responsible” can be perfectly accurately determined: the hostility towards gay people in the borough comes largely from young Bangladeshis. The tricky problem with being just one of many little patches in the progressive political quilt is that your existence is dependent on all those other cross-stitched connections holding everyone together. So staying securely tied to the overall fabric of a Left-wing worldview becomes your group’s first priority. Here in the US, our lesbian and gay organizations quietly soft-peddle violence against their own when such attacks are perpetrated by Muslims, opting instead to stick their heads in the sands of denial when faced with the creeping danger of multiculturalism. Why heck, our gay groups are too busy shilling for progressive causes to worry about a growing groundswell of Islamic counter-culture bigotry. Supporting boycotts against Israel and Arizona, hoisting the flag for public sector unions, going green with Al Gore, gee, they’re just so busy, busy, busy. When gay groups go against the best interests of large segments of their constituency to pimp for progressive causes, you better believe they ain’t gona be there for us when the chips are down. This entry was posted in Lesbian/Gay, Political/Social and tagged Andrew Gilligan, East London Mosque, Gay Free Zone, homophobia, islamophobia, multiculturalism, progressive, Rainbow Hamlets LBGT Community Forum, Spot the Fag, UK Telegraph. Bookmark the permalink.